As the nights are drawing in and the darkness is coming a lot earlier in the day, it’s even more important to be visible whilst riding your bike. 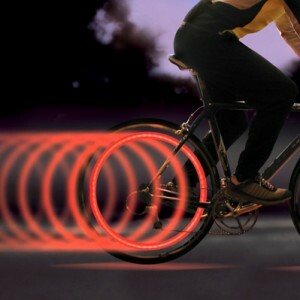 Simply and easily fit this light to the spokes of your wheel and as you ride at a steady speed, it’ll seemingly blur into a solid ring of light. It also cycles slowly through various colours as you ride. It’s waterproof, shockproof and weighs almost nothing. Awesome.